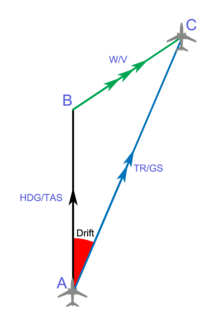 This triangle shows the aircraft's heading towards point B (HDG), and its course towards C (TR). The drift angle, in red, is due to the wind, green. In navigation, the heading of a vessel or aircraft is the compass direction in which the craft's bow or nose is pointed. There are seven fundamental ways to determine the heading of a vehicle. Note that the heading may not necessarily be the direction that the vehicle actually travels, which is known as its course or track. Any difference between the heading and course is due to the motion of the underlying medium, the air or water, or other effects like skidding or slipping. The difference is known as the drift, and can be determined by the wind triangle. Heading is typically based on compass directions, so 0° (or 360°) indicates a direction toward true North, 90° indicates a direction toward true East, 180° is true South, and 270° is true West. ^ Gade, Kenneth (2016). "The Seven Ways to Find Heading" (PDF). The Journal of Navigation. Cambridge University Press. 69 (5): 955–970. doi:10.1017/S0373463316000096.